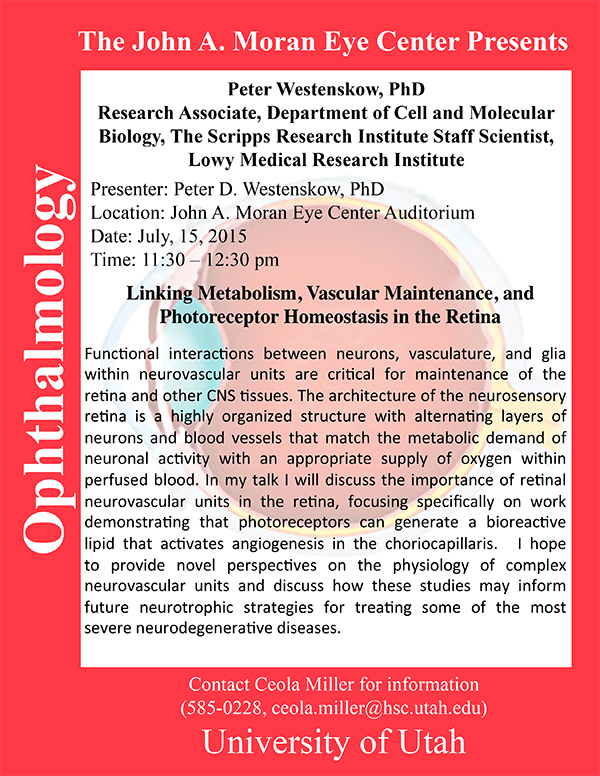 This abstract was presented today at the 2014 Association for Research in Vision and Opthalmology (ARVO) meetings in Orlando, Florida by Rebecca L. Pfeiffer, Bryan W. Jones and Robert E. Marc. 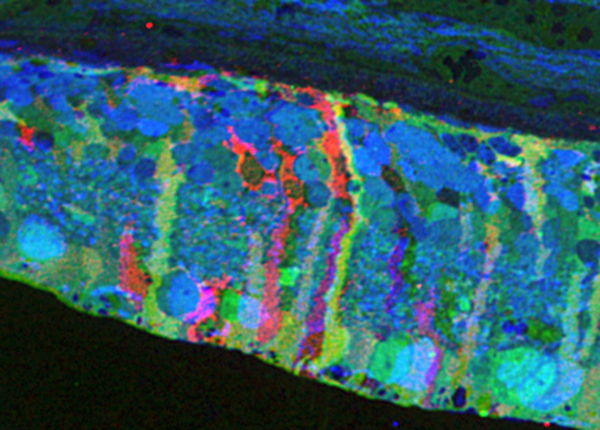 Purpose: Müller cells play a central role in retinal metabolism via the glutamate cycle. During retinal degeneration Müller cells are among the first to demonstrate changes, reflected in alterations of metabolic signatures and morphology. The timing, extent and regulation of these changes is not fully characterized. To address this issue, we evaluated Müller cell metabolic phenotypes at multiple stages of retinal remodeling. Methods: Samples were collected post-mortem from both WT and P347L rabbits. The retinas were then divided into fragments, fixed in buffered aldehydes, and embedded in epoxy resins. Tissues were sectioned at 200nm followed by classification with computational molecular phenotyping (CMP) using an array of small and macromolecular signatures (aspartate (D), glutamate (E), glycine (G), glutamine (Q), glutathione (J), GABA (yy), taurine (T), CRALBP, Glutamine Synthetase (GS), and GFAP). Levels of amino acid or protein were quantified by selecting a region of interest either within the Müller cell population or surrounding neurons and evaluating the intensity of the signal within that region. Results: CMP reveals overall decreases in GS levels over the course of degeneration. Of notable importance, we saw that in regions of near complete photoreceptor loss neighboring Müller cells may express independent variation in metabolic signatures of E, Q, and GS. Also observed in these Müller cells, ratios of GS:E and GS:Q are not consistent with the ratios seen in WT retina. These results are inconsistent with the current models of both E to Q metabolism and microenvironment regulation of Müller cell phenotypes. Conclusions: These observations indicate two conclusions. First, although the degenerate state of the retina is the likely trigger inducing Müller cells to express altered metabolic signatures, the rate at which the metabolic state changes is not purely a product of the surrounding environment, but also a stochastic change within individual Müller cells. Second, although it is commonly accepted that GS is the primary enzyme which converts Q to E as part of the glutamate cycle, in degenerate retina alternative pathways may be utilized following decrease in GS.